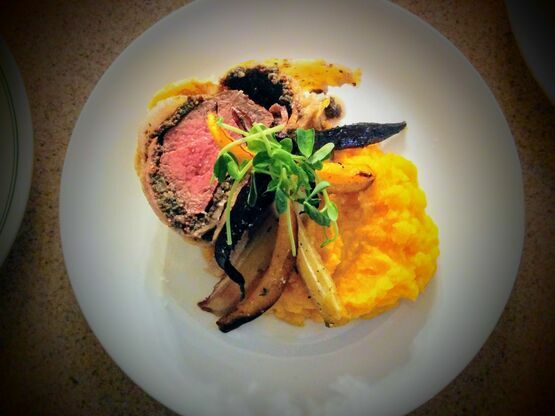 Grab that beautiful tender farm fresh filet and just admire it for a minute. It's beautiful, one of the most expensive cuts from the tenderloin, and Jeff at JTK worked very hard to have it trimmed and removed all of that silver skin you didn't want on there. 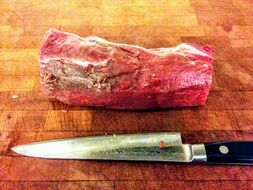 Start off by searing the filet in a pan over high heat with a little oil, don't cook it, just get a quick crust and chill.Now, slather that baby in mustard, any old mustard will do, english pub style, dijon, maple or whiskey mustard even! 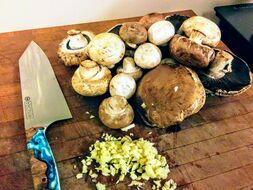 In the meantime, lets make the duxelles (fancy word for mushroom stuffing). 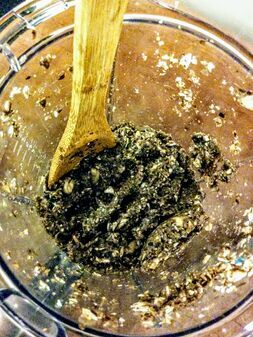 In a food processor, blender, or with a really big knife - blend the garlic, mushrooms, and salt and pepper to a nice paste like substance. Feel free to throw in some shallots, green onion, or herbs to suit your fancy. Over high heat cook out that substance for say 10 minutes. Feel free to finish the cook by deglazing the pan with say a few shots of bourbon, or cognac! Spread it flat on a plate or tray and let it cool. Take some saran wrap and lay it flat on your work surface. Lay the bacon down, slightly overlapping. 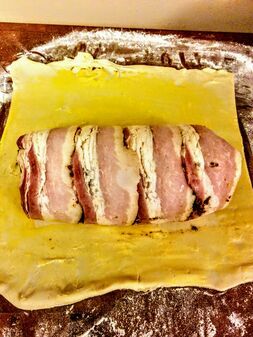 Layer on the duxelles, the filet, and then roll er up nice and tight in the wrap. Twist that sucker up like a tootsie roll. Let it set for 20 minutes in the fridge. Dust your work surface with a little flour and lay the puff pastry sheet down. 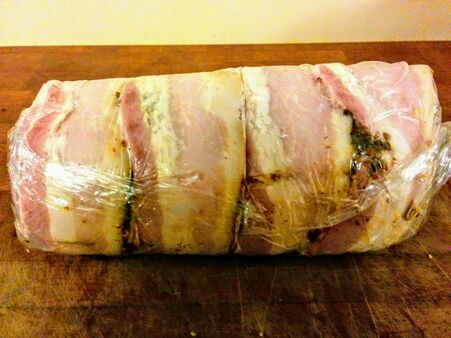 Unwrap the bacon wrapped meat log and slap it on the pillowy sheet. Brush around it with egg yolk and a pasty brush. Now we roll it again, this time when you get to where it overlaps, we cut off the excess, and seal it up just so. You can pinch your ends like the tootsie roll and then trim them off and press to seal. Brush the outside in yolk and wrap in saran. Let it chill 20 minutes or overnight if you like things ready ahead of the big feast to come. Before baking, make sure you remove the cling wrap. You can then use the back side of the knife to make some twisty lines, crosshatch pattern, or draw your favourite salvador dali. 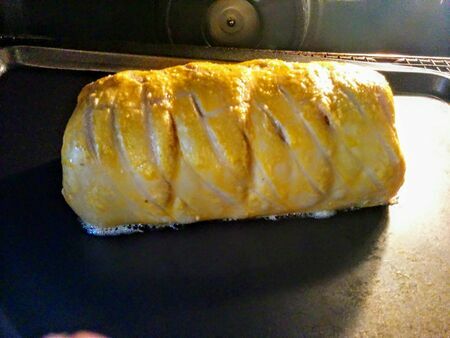 Bake at 400 degrees on a baking sheet for 20 minutes. Reduce to 350 degrees and cook 15-20 more minutes for medium rare. Use a temp probe and pull it at 125-130.Let it rest for 10 minutes - slice and serve with winter vegetables, summer salad, or a nice pile of mashed potatoes. First off, let me tell you this is a recipe. However, I like to inspire, to teach, and to create, and challenge you to do the same. So feel free to make this just as you see here, or switch some things up and make this your own! I will even throw in some ideas you can play with.